Getting a pay raise while sitting on the couch? Sign me up! Thanks Phillips 66 for the dividend increase! May has been a busy month and somehow it's just about over with. It was so busy in fact that I missed one of my favorite things about investing: a dividend increase announcement. Back on May 3rd the Board of Directors at Phillips 66 (PSX) announced an increase to their dividend. The quarterly payout was boosted from $0.63 to $0.70 or 11.1%. Assuming the dividend is maintained at this level for the remainder of 2017 Phillips 66 will have increased their dividend for 6 consecutive years giving them the title of Dividend Challenger. Shares currently yield 3.62% based on the new annualized dividend. 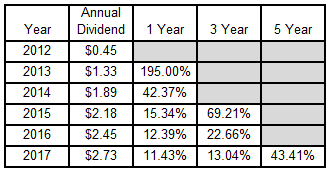 Since I own 8.289 shares of Phillips 66 in my FI Portfolio this raise increased my forward 12-month dividends by $2.32. This is the 7th dividend increase that Phillips 66 has given owners since being spun off of ConocoPhillips (COP) in 2012. Through organic dividend growth alone Phillips 66 has increased my annual dividend payments by 250% cumulatively. According to US Inflation Calculator the cumulative rate of inflation over that same time is just 6.5% so yeah Phillips 66 is definitely increasing my income faster than inflation is eating away at it. Phillips 66 doesn't have the longest streak although they've done as good of a job as possible. In 2012 Phillips 66 was spun off from ConocoPhillips and Phillips 66 has paid and increased dividends every year since. They've actually given investors 7 dividend increases out of the 20 total dividends they've paid. Even better is that they've been growing the dividend at a healthy clip too with the lowest year over year raise being 11.4%. I think I can live with that. *2017's dividend assumes 2 more payouts at the new $0.70 per share per quarter rate. A full screen interactive version can be found here. My forward dividends increased by $2.32 with me doing nothing. That's right, absolutely nothing to contribute to their operations. Based on my portfolio's current yield of 2.90% this raise is like I invested an extra $80 in capital. Except that I didn't! One of the companies I own just decided to send more cash my way. Thus far in 2017 I've received 20 dividend increases from 18 companies held in my FI Portfolio increasing my forward 12-month dividends by $112.84. My FI Portfolio's forward-12 month dividends increased to $5,675.76. Including my Loyal3 portfolio's forward dividends of $35.79 brings my total taxable accounts dividends to $5,711.55. My Roth IRA's forward 12-month dividends are at $286.85. Do you own shares of Philips 66? 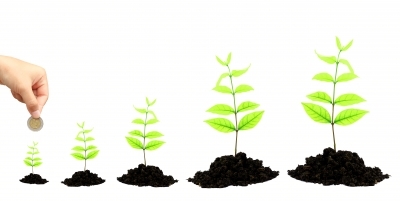 Are you happy with the dividend growth? I like the equivalent calculation for capital invested. Puts in perspective how beneficial increasing dividends are each year. I like looking at it that way because it really reinforces just how powerful dividend increases can be over time. So far this year the $112.84 of increased dividends is like I invested nearly $4k at the current yield of my portfolio. That's awesome! Nice increase, and that's what it's about - the cross over point. Keep pushing hard to get there! Slowly but surely we'll get there. After a couple years' break from serious investing I have to say it's great seeing the light at the end of the tunnel for us to get back to investing our excess cash to build our future.